Need a quick dinner? 15 minutes and this is ready. 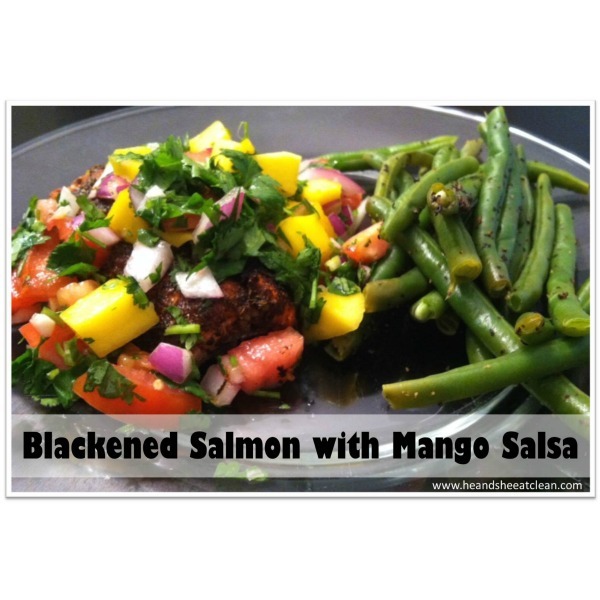 Blackened Salmon with Mango Salsa – Healthy, Eat Clean and Paleo Friendly! Mangoes are where it’s at! (With them in season right now, they are super easy to find as well.) Aside from some of the antioxidant benefits of mangoes, they just taste good and are the perfect sweet treat on a hot summer day. With the He and She gang getting together on the weekend, it was the perfect time to try out Paleoista’s Blackened Salmon with Mango Salsa recipe. Although I do not eat Paleo, books like Paleoista have great recipes that are almost always clean! Besides, if you tell me anything about the words “salsa,” I’m there – I could eat Mexican food for every meal! If you are anything like me, you may want to consider cooking this dish with the windows open in your house! For some reason, I haven’t mastered my cast-iron cookware yet! Combine the mango, cilantro, lime juice, onion, garlic and tomato in a small bowl. Stir, cover and refrigerate. Heat the oil in a cast-iron skillet over high heat. Place the fish in the skillet, flesh side down and cook for 2 minutes. Flip over and cook on the skin side for 2 additional minutes. Ensure the internal temperature of the fish is 160 degrees F prior to serving. Made this tonight and it was fabulous!! Every recipe I have made from your site is wonderful! Making this dish tonight, but using tuna steaks instead of salmon, super excited! Was looking for mahi mahi, but our market was out. Love me some mango salsa! Hmmm..mmmh! Just had this for dinner- so so good! Fiance loved it too. Thanks! I made this tonight and it was delicious!